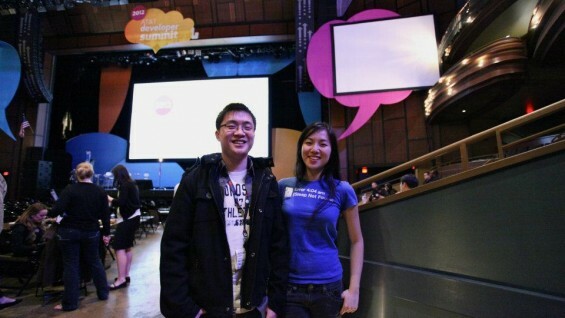 SleepBot's Edison Wang (EE'2012) and Jane Zhu at the 2012 AT&T Hackathon in Las Vegas. Before Peter Cooper was a philanthropist, he was an entrepreneur. He made his fortune in nineteenth century America by meeting the challenges of his time with ingenuity and wit. His designs and inventions were as multidimensional as his interests and passions: from the first American steam locomotive to the self-rocking, music-playing baby cradle, Cooper tackled the problems of his time on both the industrial and personal levels. His business ventures were likewise varied, and his many successes were often the result of a maverick outlook. When Cooper purchased a glue factory in 1821 in Kips Bay for $2000, for instance, he wasted no time in streamlining the production process and increasing factory profits to $10,000 annually—all in just two years. New York City may not have many remaining glue factories or steam locomotives today, but the same enterprising spirit that animated Cooper continues to inspire students at The Cooper Union. Take electrical engineering senior Edison Wang for example. He teamed up with NYU business student Jane Zhu to develop SleepBot, an application for Android phones that currently boasts over 600,000 downloads and 400,000 regular users. Built entirely by Mr. Wang with Ms. Zhu’s assistance on design, operations and publicity, SleepBot is a leading contender in an expanding field of personal awareness technologies—in this case, helping users track their sleeping patterns. The idea for the application came about when Mr. Wang—who studies full-time and works a part-time software engineering job—continually found himself chatting online with Ms Zhu late into the night. “I wonder how much sleep we actually get?” they began to ask each other. Before either could posit an answer, they found they were not alone in the asking. As the American Psychological Association and the National Foundation for Sleep have reported in recent years, increasing numbers of Americans get less sleep than what doctors recommend. While the reasons are likely multipronged, technology use certainly plays an important role: the National Foundation for Sleep, for example, issued a special report in 2011 on technology use as it relates to sleep. Of the results they found is a rising trend of increasing technology use in the hour before sleep. “People are taking their phones to bed with them,” Mr. Wang explains. “So why not use phones to help people understand their own sleep habits better?” SleepBot tracks a user’s sleep patterns over time, producing detailed graphs and other data as sleep patterns aggregate. His application “doesn’t judge” its users however, Mr. Wang insists. Instead the software simply reports data and lets users or their doctors determine how it might best be used or interpreted. While Mr. Wang hasn’t yet monetized SleepBot, he and Ms. Zhu have already won two major competitions with their product. SleepBot was recognized by the United States National Institute of Health and the National Academy of Engineering as the first place winner of the Health 2.0 "Go Viral To Improve Health" competition in 2011. Then in January 2012, SleepBot took home second place in the AT&T Developer Summit Mobile App Hackathon in Las Vegas. Prize money from these competitions has provided the two with seed funds to continue developing their software and position SleepBot in wider markets—particularly as a tool for doctors to use in place of traditional sleep logs, which Wang points out can be tedious to fill and upkeep by hand. Mr. Wang and Ms. Zhu will soon be launching MySleepBot , an interactive web version of their popular Android app. On February 7, 2012, a new faculty and student-led group convened to cultivate and encourage precisely this kind of student enterprise. The Cooper Union Entrepreneur Society was initiated by Dean of Engineering Simon Ben-Avi and engineering professor and entrepreneurial veteran Rob Marano. Its first meeting attracted a number of students and several supportive alumni and faculty. Not surprisingly, Edison Wang was among them and remains a member of the group. The goal for the society is to create the kind of support system the two founding faculty say they never had as students. "I started this society with the intent to provide a time and a space for students to think and invent with complete freedom,” says Dean Simon Ben-Avi. “Our vision and mission are to encourage the entrepreneurial spirit in our students, and we hope that by contributing to their success, they will give back to The Cooper Union in return, and help to support their successors." Professor Rob Marano has similar goals for the group. When he graduated from Cooper Union in 1993 with a electrical engineering degree he went to work for General Electric as a satellite electronics engineer. After this came software engineering positions at Lockheed Martin, and later in the finance and tech sectors. Most of his professional time these days however goes into managing his own business: InDorse Technologies, a leading information-rights management firm that develops products to enable companies to track the sharing of documents and digital information assets. Today InDorse has offices in New York and Oxfordshire, United Kingdom. More than half of the firm’s employees are Cooper Union graduates. Student entrepreneurs with faculty and alumni advisers. Top Row, from left: Eric Leong, Ethan Lusterman, Eric Forkosh, Daniel Kanner, Bottom row, from left: Yash Risbud (EE'92/MEE'94), Dean Simon Benavi, Rob Marano (EE'93), Paul Garrin (A'82), Sean Cusack (BSE'98). Photo: Joao Enxuto. Even more exciting perhaps are the historical circumstances for realizing such a venture today. While the American economy struggles to regain a steady traction on the way to stabilization and recovery, the country’s tech sector continues to produce successful companies and create high-paid jobs. It was in fact the tech sector that President Obama recently called out during his 2012 State of the Union to continue creating American jobs and lead the economic recovery. Part of the reason for the optimism is that, compared to brick and mortar businesses that often require significant amounts of capital investment to get off the ground, software and Internet development can often be bootstrapped with relatively little seed money. The efflorescence of mobile computing platforms, open source development tools, cheap hardware and ever increasing bandwidth and processing capacities all make for an incredibly ripe environment for software development. The cost of entry into the field meanwhile may have never been historically lower. Professor Marano leads the discussion in his distributed computing class. While the American tech industry is still ostensibly centered in Silicon Valley, New York City has become home to a growing number of game-changing companies. The megalithic Google opened their sprawling Manhattan offices just last year of course, but smaller firms with runaway success stories also crowd the island. Companies like the crowd-source funding site Kickstarter and the immensely popular blogging platform Tumblr are locally grown businesses still headquartered in the city. Online crafts marketplace Etsy is run out of offices in DUMBO, Brooklyn, while social media giant FourSquare recently relocated from their East Village workspace to a larger midtown outpost. The cash for innovation isn’t far, either. New York-based venture capital firms provide significant capital investments to fledgling technology businesses and are behind some of the names mentioned above. Part of Marano’s efforts in assembling the Entrepreneurs Society is to make his extensive network of contacts in the world of venture capital available to students when sources for funding become necessary to take a project to the next level. This semester Professor Marano is teaching a class on distributed computing. While not explicitly about entrepreneurship, the topic of developing new products is the center of most class discussions. The technology his students focus on in class runs much of today’s more popular Internet businesses. Students consider platforms like Apache Hive and Hadoop for their projects, a distributed data warehouse infrastructure and software development framework receptively, used extensively by Facebook and Netflix as well as a host of other major players. Java, Python, and NoSQL are on the class agenda as well, core technologies that power today’s application-driven and data-heavy Internet, helping students by bolstering resume skill sets as much as offering big-picture views of how real businesses really work.